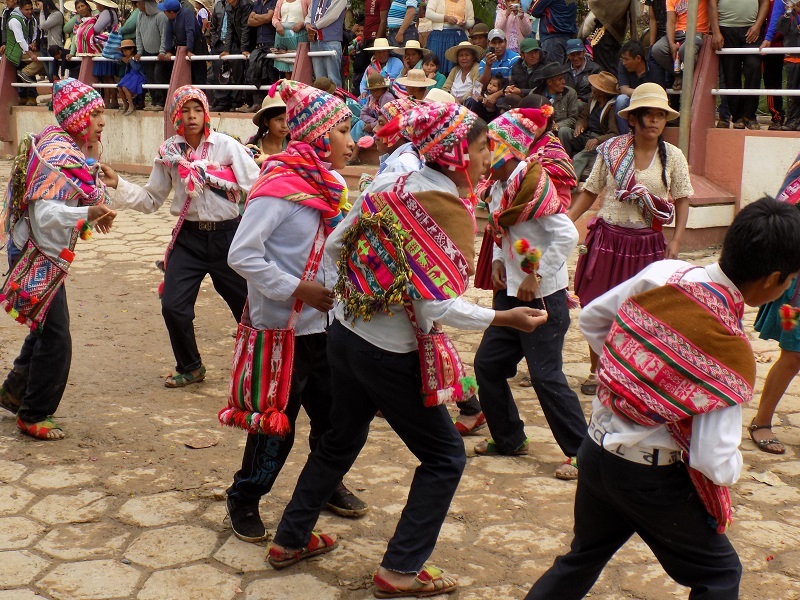 On the 2nd day of Carnaval, the communities dance in the plaza again, but the dancers wear modern polleras (skirts) and pants instead of the scratchy bayeta (woven wool) polleras and pants. 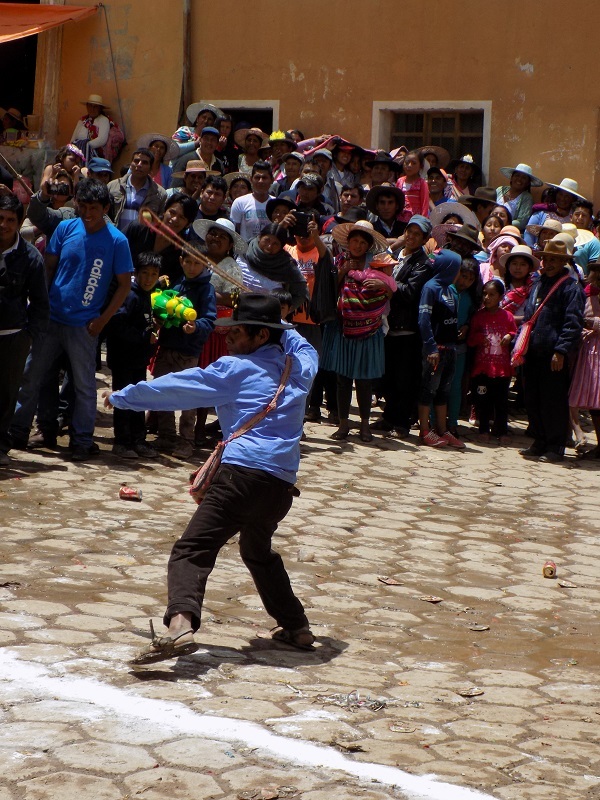 There are fewer water balloons flying so it is easier to focus on observing and photographing the woven aguayos (cloth for carrying on the back), chuspitas (small shoulder bags traditionally used to hold coca leaves), and the knitted ch’ulos (caps with ear flaps). No weaving with natural dyes was spotted. 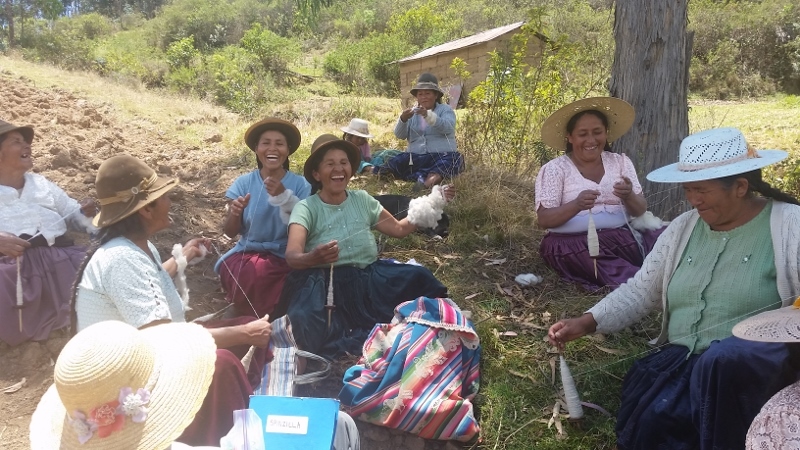 All of the aguayos and chuspitas were woven with brightly dyed synthetic yarn. 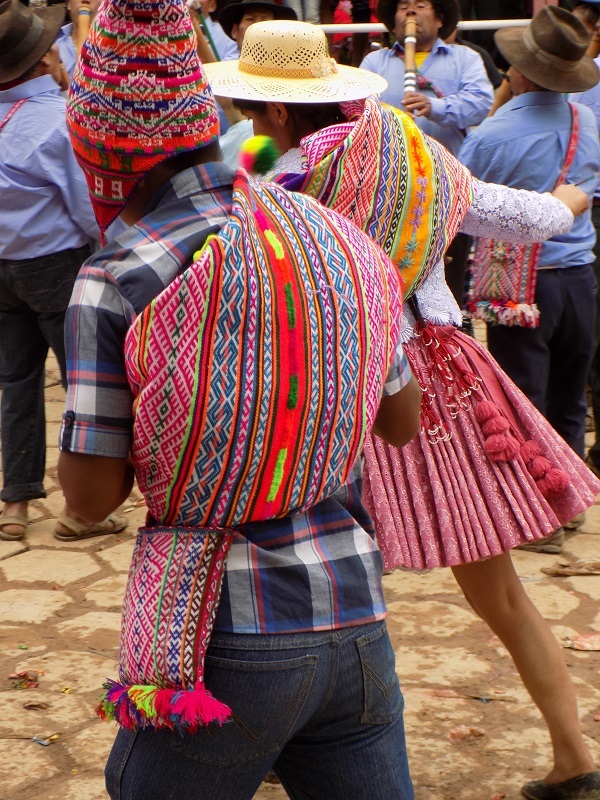 The ch’ulos were knitted with synthetically dyed local wool or brightly colored synthetic yarn. 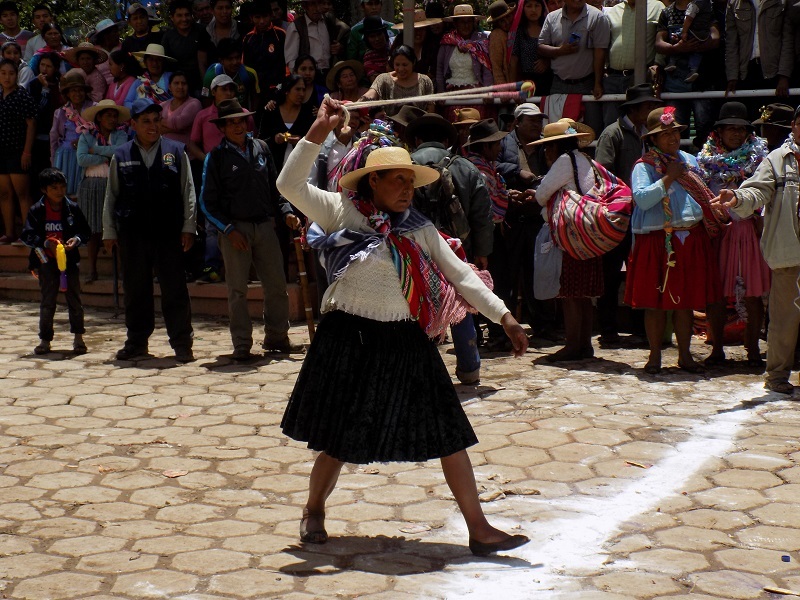 The annual warakanaku competition followed the music and dancing. 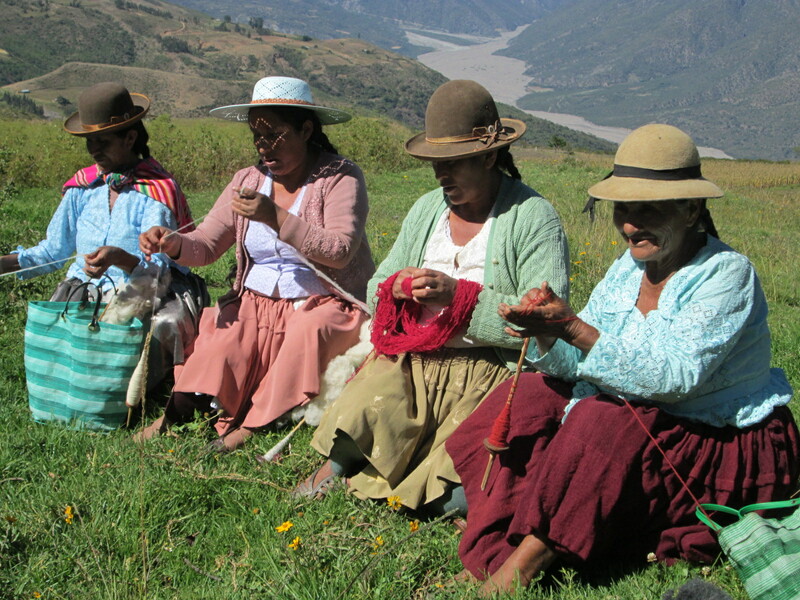 The warakanaku is a braided sling, often of llama fiber. Rural men and women carry a sling tucked in their waist band while out pasturing their livestock, and keep a few pebbles handy to fling at predators or to use on their livestock to keep them moving. Government officials lugged a bag of powdered chalk into the middle of the plaza and scooped out handfuls to make 2 lines about 20 feet apart. 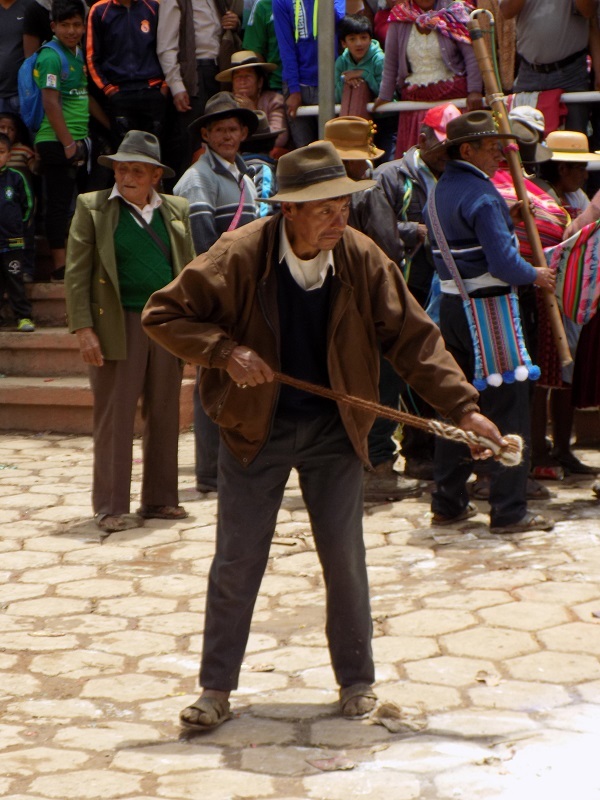 The names of the first 2 contestants were called and the men met between the chalked lines throwing their slings around the neck of the other and dancing to the right and then to the left. They walked to their places behind the chalked lines then turned to face each other cracking their slings aggressively. At the word from the announcer one man turned his back while the other loaded his sling with a peach and wound up. Most of the men had already dipped heavily into the chicha buckets and although there was a lot of power behind their fling their aim was off. Much to the amusement of the spectators the peaches flew down the road splattering the unwary blocks away.